Wait what does it have to do with bologna? oh, that's just a bunch of balogna. A very very delicious meat product; often used in sandwiches, but is still yummy on its own! I am well aware of what bologna is as we eat it a lot in sweden, I was just typing how you pronounce it! well I pronounce it baloney. and I think that's the norm here. why do they pronounce it balogna "boloney" anyway? It's because the bologna is a typical product of the namesake Emilia Romagna city of Bologna. The city does have the right coloration. How would that be pronounced in typical English phonetics? I've heard it said both ways but only on TV shows, we don't eat it much in Australia, we mostly have shaved ham, berliner, salami, pretty much everything except actual bologna. My mom would probably love it there. She hates bologna. I meant the weird N.
I have a felling a few of you will find this interesting. click on a dog and have a listen. That was a lot of fun Brent! I liked how the Akita made it a point to mention that he does not want to be a Sumo wrestler. would you rather fight 100 duck sized horses or one horse sized duck? But what a random question. Well, the duck-sized horses could trip you and then swarm all over you. But the horse-sized duck would...have a better chance of eating your head with its massive bill. And it could step on your toes with its massive webbed feet. ducks have no teeth, so it would only be able to crush your skull. I'd still go with duck sized horses. easier to kick them away. A horse sized duck would be awesome. Of the two, I suppose all I can say is, yes. I vote flying killer cobbs from the planet of bob. I would go with the 100 duck sized horses. Ducks are mean and a horse sized one would probably be able to take you out fairly easily. Horses on the other hand are by nature a cowardly and superstitious lot that are much easier to spook. I'd choose not to fight because they're all creatures of this great planet and hurting any of them is wrong. Assuming you have no choice in the matter--you're going to have to fight--I would go with the horse-sized duck. Hands down. Have you ever tried fighting one hundred of anything? You'd get completely swarmed. At least with the single duck, I could dodge out of the way and employ legitimate 1v1 combat techniques to keep myself going. With a hundred horses, there's really nothing you can do but flail around until you eventually tire yourself out and get trampled. if I can eat em, I would fight em. I would never want to hurt an animal like that. Unless it's punching a tyranosaur in the face. 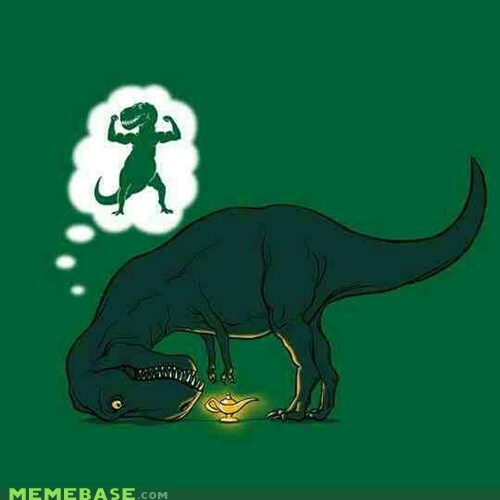 what if the t-rex had bigger arms? Sleet has an apparent bias for certain animals. Who doesn't? Most people say that they want to protect animals... but what they really mean is they want to protect animals they like. The biggest evolutionary advantage an animal can have is to be considered cute by humans. Well, that or be so big and terrifying that humans won't approach you. That might be just as good. Then we'll be eager to shoot and kill it if it ever gets too close.